Back in the 1970s when I was a young man, I was crazy for the Chicago blues. There was a local band called the Honolulu Doggs that knew how to play the real stuff and so, while the rest of Waikiki was doing cocaine and “The Hustle,” I was down at the Dragon Lady (currently Wave Waikiki) six nights a week listening to the Doggs do the Willie Dixon songbook, plus Little Walter, Muddy Waters and Howlin’ Wolf. They were Hawaii’s version of the Strongstorm, so I don’t want to hear about how I missed the One Knite. Heaven arrived in 1976 or ‘77, when Muddy Waters played every night for a week at the Kool Jazz Fest at the Waikiki Shell. My boss, a concert promoter, lost his okole on the fest, which drew half houses every night, but I loved seeing such legends as Earl “Fatha” Hines, Ray Brown, Milt Hinton, Dizzy Gillespie and especially the Muddy Waters Band. As if that wasn’t enough euphoria for a 20-year-old man, Muddy’s band showed up at the Dragon Lady, a Korean dry hustle joint by day, every night and jammed until 4 a.m. Drummer Willie “Big Eyes” Smith, harp player Jerry Portnoy and guitarist Bob Margolin were always there, and bassist Calvin Jones and guitarist Guitar Jr. showed up a couple of times. But piano man Pinetop Perkins was always the first one to show up. The Doggs usually didn’t have a piano, just a B-3 organ, but they got a Fender Rhodes the second night because when Pinetop sat down he didn’t get up and the organ player was left out. The thing I got from Muddy’s band, who would later be billed the Legendary Blues Band was that they lived to play the blues. They were just incredible, night after night. 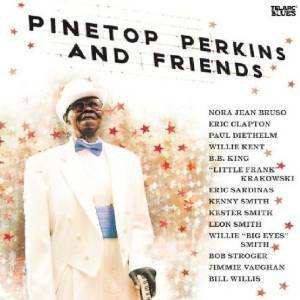 Although it’s a little rougher, a little looser, the new “Pinetop Perkins and Friends” album, featuring such guitar greats as B.B. King, Eric Clapton and Jimmie Vaughan reminds me of those magical nights at the Dragon Lady. Pinetop, who lives in Austin, will be 95 years old on July 7, but he can still play that boogie woogie blues. That he’s had an amazing life in music comes out loud, but not always clear, on an album that sounds like a jam amongst friends. Expect another Grammy nomination for this national treasure. “Pinetop Perkins and Friends” comes out June 3 on the Telarc label, though if you’re on Sixth Street before then. I’d bet you can coax Pine who’s usually at Nuno’s, to sell you an advance copy. How cool is it for Austin that a living blues legend is out there on the street almost every night of the week?